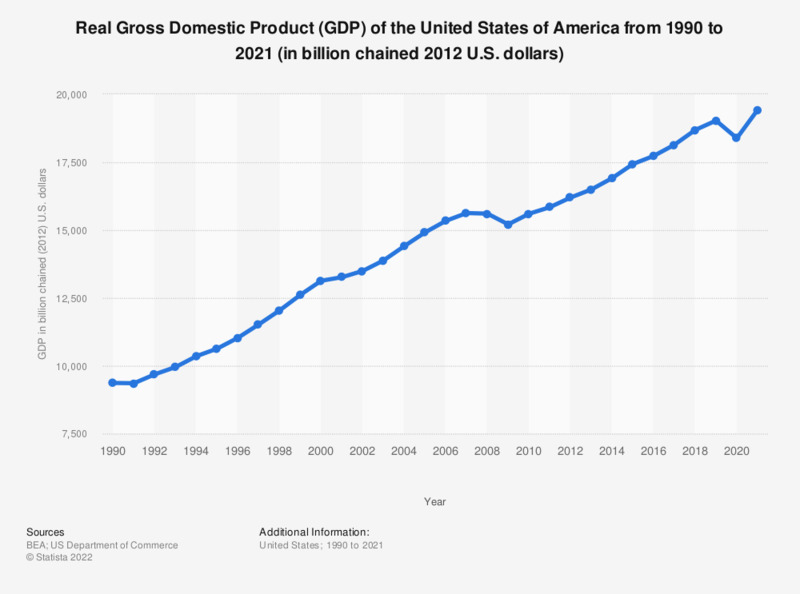 This statistic shows the development of the Real Gross Domestic Product of the United States of America from 1990 to 2018 in annual numbers chained to the U.S. dollar value of the year 2012. In 2018, the United States generated about 18.57 trillion U.S. dollars (2012 chained). See the US GDP for further information. Real Gross domestic product is an inflation-adjusted measure that reflects the value of all goods and services produced in a given year, expressed in base-year prices. Real GDP in the U.S. The real GDP of the U.S. has increased from 9.37 trillion U.S. dollars (2012 chained) in 1990 to 18.57 trillion U.S. dollars in 2018. Similarly to some other countries, the United States has experienced a steady growth in GDP over the last few years. India experienced a 6.5 percent growth from 2016 to 2017 while China’s GDP grew by 6.9 percent in the same period. One of the defining qualities of the United States’ economy is its diversity and advanced technological advancements. Industries such as finance, real estate, health care, and business and education services are large contributors to the economy, while the manufacturing sector accounts for about 11.6 percent of the country’s wealth. The GDP generated by each state can also vary widely based on principal industries and production. In 2017, California had one of the highest GDP’s in the United States, reaching 2.75 trillion U.S. dollars, comparatively; Vermont generated a GDP of 32.2 billion U.S. dollars in 2017. Real Gross domestic product is an inflation-adjusted measure that reflects the value of all goods and services produced in a given year, expressed in base-year prices. The base year for the dollar value in this statistic is 2012.